Mr. Eric Ratica is the director of bands at Norwayne Local. He graduated from Youngstown State University and received a masters degree in music education from VanderCook College of Music Education. Mr. Ratica's hobbies include driving around in his black Miata, camping, traveling to big cities and of course listening to music. He currently is a proud member of the Cleveland Brown's Drumline. 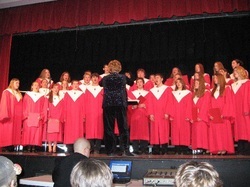 Mrs. Leanne Ratica is the director of choirs at Norwayne Local. She also graduated from Youngstown State University and received a masters degree in music education from VanderCook College of Music Education. Mrs. Ratica's hobbies include reading, traveling, camping and visiting the Rock and Roll Hall of Fame.